One of the big reasons why overnight breakfast casseroles are so great is that they are so darn EASY! Prep the night before and pop in the fridge. Then when you wake up in the morning, throw it in the oven and bam! Breakfast is served. Clean up is usually easier because you’ve done all the leg work the night before and tidied up. They are perfect to serve to a house full of guests. I figured with the holiday season coming up this would be a timely post to write both for myself and for you, my lovely readers! I included a link to one of the more popular recipes on my site, Wife Saver Breakfast. It’s always a hit! 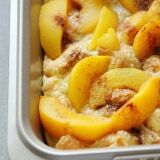 Apple Cinnamon Bun Breakfast Casserole – A sweet way to start your day and feed your guests! It’s made with cinnamon buns + apple pie filling for a mouthwatering breakfast casserole you’ll make again and again. Mediterranean Brunch Bake – Save yourself time and do all the prep the night before. You’ll love how much flavour is packed into this holiday breakfast/brunch recipe! Sausage & Butternut Squash Breakfast Casserole – A delicious, hearty and easy breakfast casserole recipe perfect to serve to your holiday guests! Banana Bread Breakfast Casserole – Use up your brown bananas and leftover bread in this crowd-pleasing breakfast recipe! It comes together in 10 minutes, bakes for 1 hour and is a recipe you’ll find yourself making again and again. Eggnog Breakfast Casserole – Meet your holiday breakfast! I also shared savoury and sweet recipes. Some are almost like dessert! Who wouldn’t want to eat Pumpkin Pie French Toast? I’d love a plate of it right now! 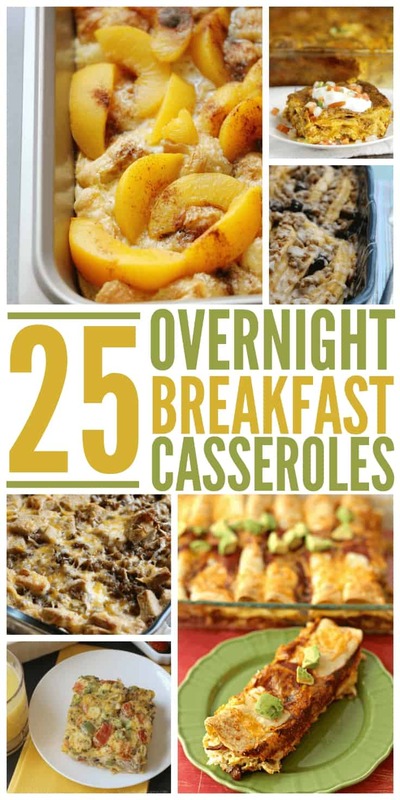 Check out this recipe list of 25 overnight breakfast casseroles. 1. Wife Saver Breakfast – Save time in the morning with this easy Wife Saver Breakfast recipe! Croissants are topped with a sweet egg layer, peach slices, cinnamon and maple syrup. 2. 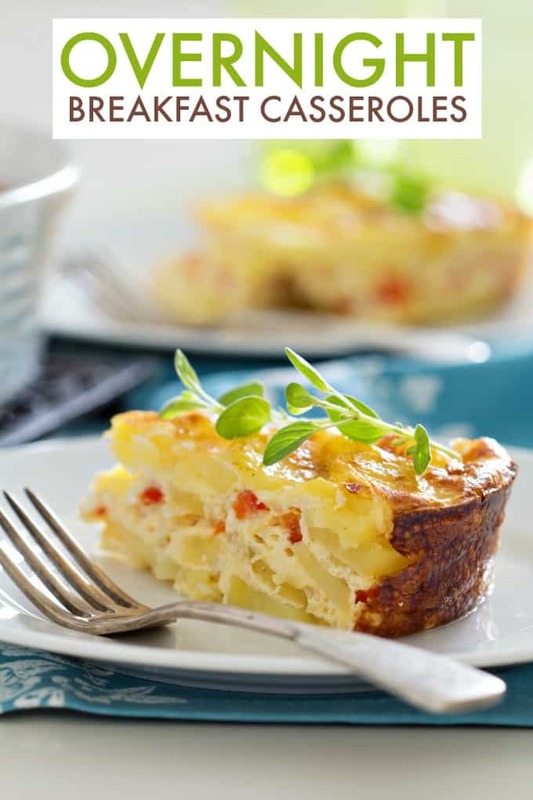 Farmers Market Overnight Breakfast Egg Casserole – Loaded with bountiful veggies, this hearty egg bake is deliciously satisfying, without weighing you down! Unlike many recipes, this egg casserole is made without bread. 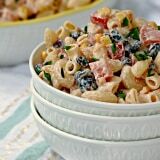 And since you can make it the night before, it’s perfect for holiday brunches or make-ahead family breakfasts! 3. Overnight Breakfast Enchiladas – Loaded with hash browns, pinto beans, green chilies, bacon, eggs, enchilada sauce, and cheese! 4. Paleo Overnight Breakfast Casserole – A delicious paleo casserole that will save you time in the morning. 5. Mexican Breakfast Casserole – A make-ahead, overnight breakfast casserole, packed with flavor, cheese, eggs, and spicy chorizo. Great for holiday mornings and brunch get-togethers. 6. Overnight Blueberry Waffle Bake – An easy, delicious breakfast bake that makes a perfect start to the day. 7. Peaches and Cream French Toast – When you are looking for a big breakfast for Christmas morning. 8. Savory Sausage and Cheese Breakfast Casserole – All the yummy ingredients of a sausage breakfast sandwich but even easier to make. Even better the next day, reheated and topped with homemade salsa. 9. Everything Bagel Overnight Breakfast Casserole – Everything bagels are the stars in this easy, cheesy recipe. 10. Blueberry Lemon French Toast Bake – Easily prepared the night before and baked the morning of. It’s bursting with big flavors of fresh berries and refreshing lemons. The blueberry sauce is incredible. 11. Ham Croissant Breakfast Casserole – A magical casserole perfect for lazy mornings. 12. Overnight Raspberry Almond Baked French Toast – With whole wheat bread, fresh raspberries and an easy granola crumble topping! 13. Overnight Bacon Asparagus Breakfast Casserole – A great spring breakfast choice while the asparagus is in season. It’s also really good with ham instead of bacon. 14. S’mores Overnight French Toast Casserole – An easy, overnight french toast casserole is topped with marshmallows, chocolate chunks and graham crackers and baked until irresistibly gooey. Only 8 ingredients! 15. Overnight Pumpkin Pie French Toast – Wake up to a delicious breakfast that bakes while you sleep. 16. Cheesy Overnight Sausage Breakfast Casserole – Full of flavor with lots of melty cheese and sausages! Make this for Christmas morning and your family will tell you it’s the best breakfast they ever had! 17. 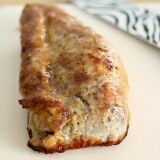 Maple Sausage, Apple and Sage Strata – Maple sausage, sweet chunks of apple, bits of sage, and the sharp flavors of provolone cheese combine together in this easy dish for a super flavorful breakfast or brunch dish. 18. Apple French Toast Bake – Transform classic French Toast into an appley indulgence! 19. Overnight Sausage, Egg and Cheese Breakfast Casserole – This overnight sausage, egg, and cheese breakfast casserole recipe is incredibly simple to prepare, and so convenient when you don’t have time to cook in the morning! 20. Savoury Bread and Butter Pudding – Be a guest at your own breakfast! 21. Sausage, Egg and Spinach Overnight Casserole – Easy and incredibly delicious! 22. Sausage and Mushroom Overnight Breakfast Strata – A crowdpleasing breakfast everyone loves. 23. Overnight Cinnamon French Toast – Crunchy nuts, chewy fruit and the warm taste of cinnamon. 24. Ham and Cheese Breakfast Casserole – Got leftover ham? Here’s a great recipe. 25. Easy Cheesy Overnight Italian Strata – Works well for breakfast, lunch or dinner. Some kitchen tools you might need when you are making overnight breakfast casseroles. I think I’m set for a while for recipes! Which recipe are you looking forward to trying? If you enjoyed this breakfast casserole round up, you’ll also love these posts! Loving all these especially the Apple French Toast Bake recipe. YUM! My children would love the Overnight Sausage, Egg and Cheese Breakfast Casserole . I love breakfast. It is my favorite meal of the day. This is a great post. Thank you for putting together this collection. This is something I have always wanted to try. Blueberry Lemon French Toast Bake sounds scrumptious. Thank you sooooo very much for ALL these terrific recipes!!! I emailed to friends too! And will be trying a lot of them!THANKS AGAIN !!! Love the variety in this! I am always looking for options like these to free up time to enjoy overnight guests at any time of the year. Thanks!! Thank you so much for sharing my recipe!!! Thanks for sharing this delicious recipes,i love making a day ahead ! 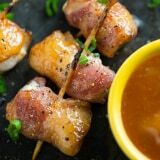 I like that some of these are sweet and some savory, great for having company over.